Automated dosing systems can be expensive, which means they’re often an intimidating investment for small farmers. However, many growers note that their upfront investment pays off once they start saving on time and labor costs, especially if they’re beginning to scale their farm or hire employees. If you’re a hydroponic or aquaponic farmer, you are likely familiar with the time-intensive process of manually testing and dosing nutrients and pH adjustments in your system. As business owners, we know that time is money, and if there’s any way to save on both, we’re likely to jump on it. We’ll discuss what automated dosing systems are, how they work, and how they can benefit your farm and business. This information will help you decide whether or not you’d like to take the leap and purchase one. What do automated dosing systems do? At a high level, automated systems reduce the manual workload of managing your nutrients: measuring, dosing, and testing pH, EC, and temperature*. When done by hand, these tasks can take up a sizeable portion of your highly valuable time, or that of an employee, increasing your labor costs. These systems can also help you reduce human error: you’ll cut down on over- or under-dosing and shocking your plants by accidentally adding an incorrect amount of nutrient. Now, you might be thinking “I have an aquaponic system, so I don’t need to manage nutrients in the same way, and therefore, I don’t need an automated dosing system.” Don’t be too hasty. These automated systems can benefit aquaponic growers just as much as they benefit others. While aquaponic systems do not require the same inputs, it is often—if not always—the case that you’ll consistently be supplementing chelated iron. You can use automated dosing systems to monitor and adjust pH and iron in aquaponics the same way you would in hydroponics! *It is important to note, however, that while automated dosing systems will measure the amount of nutrient in your reservoir, they will not measure and mix your nutrients for you. Learn more about this in the next sections. Depending on the type of automated dosing system you’re looking at, it’ll come with a number of sensors or probes. These measure water chemistry parameters like pH, EC, and temperature. Some more advanced systems include environmental sensors that will monitor conditions like air temperature, humidity, and CO2 concentration. These sensors and probes work the same way that your handheld meters do, only they’re all connected to one computing system. Since the system is automated, it allows the user to set determined parameters which the computer will compare to the real-time measurements it’s taking from the reservoir. In response to those measurements, the computer makes adjustments by operating a series of pumps. These pumps are connected to lines that are placed in buckets, which contain nutrient mixes and pH adjusters. Pay attention to whether your system trends upward or downward in pH—you may want to switch to pH up if there is a consistent downward trend. Read more about pH here. In small intervals, the system pulls solution from the appropriate bucket into the nutrient water until the readings on the meter meet the programmed target parameters. Systems like the IntelliDose allow the user to set alarms for when something goes awry and include a host of other useful features. Some auto-dosing systems allow growers to set different parameters for different systems within the same farm. How much can I save with an auto-dosing system? Most growers can save upward of 15–30 minutes a day by using an auto dosing system. Multiply that by the wage that you’re paying a system manager, add it all up to the lifetime of the auto-doser, and you’ll see your savings potential. However, the benefits of an automated dosing system stretch beyond “minutes saved.” Auto-dosing systems can help prevent costly events like crop loss due to human error, and can even lead to more beneficial results, such as increased yield. Growers have several options for auto-dosing systems. Aquaponic growers may use only pH and iron dosers, for example. Small-scale growers may decide that a monitoring unit serves their purposes just as well as a full auto-dosing system. Whichever direction you decide to go, always balance the price of labor and time against the price of an auto-dosing system. Monitoring-only units will typically cost between $250 and $400. For instance, an all-in-one handheld meter may run at $280. When you add dosing and remote login capabilities, the price runs closer to $2,000. Systems like Growlink can be customized for your farm, but they’ll likely run you a pretty penny. In ZipGrow systems, the sump tank acts as a “collect-all” for system water before it is redirected to the mixing tank and sent to irrigate the towers again. Here, the tank is equipped with an IntelliDose system. Like most auto-dosing systems, it consists of a controller where the user programs their desired parameters. The EC and pH probes are placed in a small basket-like contraption inside of the reservoir. At the bottom of the reservoir, there is a pump that keeps the water moving so that the probes are always taking an accurate reading. If the water is too still, it is possible for the nutrients to settle along the bottom of the tank. As you can imagine, probes at the top of the tank, in this case, would read differently than if they were at the bottom. It is ideal to have a consistent concentration of nutrients throughout the reservoir. We like to hang the IntelliDose controller, pumps, nutrient buckets, and a small electronics box to hold cords on the side of our mixing tank (we use an IBC). This allows us to remove and replace nutrient buckets quickly as well as keep the floor clear for cleaning. The electronics box keeps cords out of the tripping and dripping zones to avoid accidents and improves the safety of the farm. While this may seem like a “set-it-and-forget-it” type of system, we would like to discourage you from thinking that way. As a part of your daily or weekly farm maintenance, you should take a few moments to ensure that everything is working as it should. Additionally, you will need to calibrate the probes about once a week and occasionally check the water manually. Ready to get an auto dosing system? If you’re ready to take the plunge into auto-dosing, we recommend systems from Hydrofarm, BlueLab, and Autogrow. Begin your exploration with a needs assessment to determine exactly what you need before you purchase a system so you get one that fits your operation. We chose the IntelliDose System from Autogrow because it is well-made and comes with great customer support. 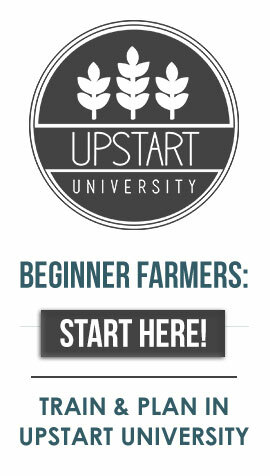 Anyone can run a profitable local farm, and at Upstart University, we’re dedicated to unlocking that possibility. At Upstart University, aspiring farmers can learn the tricks of the trade from building a business plan and securing funding, to managing a hydroponic or aquaponic system and achieving high crop yields. I am an upstart farmer from Barcelona. First of all, thank’s a lot for the video! If you have a low EC level, it’s ok to add nutrients without knowing the ppm that the plant has been taken? I read that you should only add your nutrient solutions when you start with the mixing and you change it every 15 days. Our suggestion is to keep testing the EC of your nutrient solution a couple times per day, and add nutrients if your EC leaves the recommended ranges for the type of crop you are growing.